When our shiny new stock of platform trucks arrived we weren’t expecting a rogue tap dancer to take a shine to them! So, it appears 25th of May marks National Tap Dance Day, a day when the art of creating rhythms and sounds by hitting the floor with your feet whilst wearing shoes with metal plates on the bottom, is celebrated worldwide. Tap Dancing dates back to the 19th century and has been linked to tribal dances from Africa and Irish and ethnic dances. Despite a decline in popularity over the years, recently its presence has increased thanks to the likes of Strictly Come Dancing and the revival of musical theatre shows such as Crazy For You and 42nd Street. So, next time you suffer from an attack of the rogue tap dancer, here’s how we protected our mesh-sided platform truck from scrapes and dents using a piece of 3mm fine fluted rubber matting. It’s also a great solution to protect your truck from day to day wear whilst loading and unloading goods. It also creates a super non-slip surface. Optional cardboard or off-cut of wood to protect surface during cutting of mat. Measure from the very edge, the truck we used is 1270 mm long x 810 mm wide. Remember the old adage… "Measure twice, cut once"
Using a sharp Stanley knife and a metal rule to ensure a straight and even cut, carefully cut your mat to your desired size. We placed our mat onto the concrete floor of our warehouse but to avoid any scratches beneath the mat you may wish to place it on an old cardboard box or similar. To hold the mat in place you will need to cut four holes, one in each corner. Remove any side panels and ends so that your platform base is clear. Place your freshly cut mat onto the platform base and line up the edges. We used a 20 millimetre socket to draw around to mark the placement of our holes using a soft pencil. Remove mat from the platform and carefully cut out the mat to leave holes, once again using a sharp blade. Place your mat onto the platform base and line up your newly cut holes with those in each corner of your truck. Insert your platform handles into the holes and secure into place onto the underside of the truck using the screws and allen key provided. Nb. For a more permanent solution you may like to use some double-sided tape so secure the edges of the matting to the metal edge before replacing the ends and or sides. Hey presto you now have a rather funky, anti-slip, hard wearing base for you platform truck. Rubber mat is available in 3mm or 6mm thicknesses, we have used the 3mm, 6mm would work equally as well although is heavier and may prove more difficult to cut. 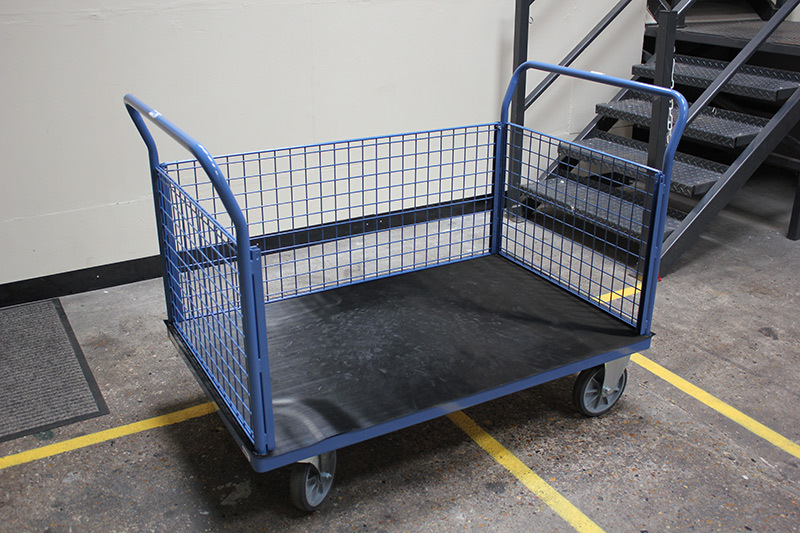 For free information, help and advice about our platform trucks or matting give us a call on 0808 278 3258 and one of our team will be happy to help. PS. No tap dancers or dragons were harmed in the making of these videos.